Home » All News » Check out the following topic courses offered by the Italian Program in Spring 2019! 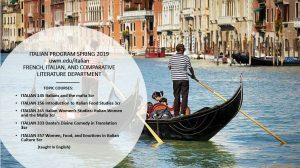 Check out the following topic courses offered by the Italian Program in Spring 2019! Here are the topic courses offered by the Italian Program in Spring 2019!